There are typically three pedals on modern pianos. 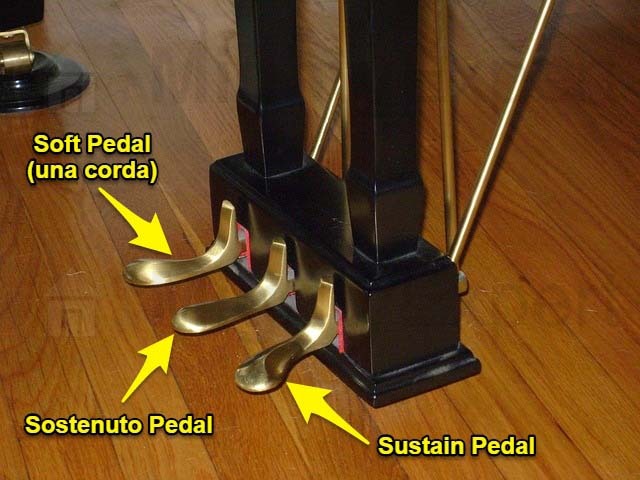 The leftmost pedal is called the “soft pedal”, the middle pedal is the “sostenuto pedal”, and the rightmost pedal (most commonly used) is the “sustain pedal”. The left soft pedal (una corda pedal) was originally invented to modify the tone and color of notes played on a piano by hitting one (una corda) or two (due corde) strings instead of the typical three by shifting the action of the piano sideways. Playing with the una corda pedal depressed gives your music a softer tone with a different color. Note that on upright pianos the action isn’t actually shifted. This means upright pianos don’t have a true una corda pedal, but rather, a pedal often called the “half-blow pedal” since it moves the hammers closer to the piano’s strings (creating a softer sound). The middle sostenuto pedal is used to sustain only certain notes (the ones that were pressed down when the pedal was pushed) and let the pianist play all other notes without sustain. It essentially lets the piano player selectively sustain certain keys or chords. The right sustain pedal lifts every damper in the piano off the keys, letting the notes be “held” and keep vibrating. Holding down the sustain pedal while playing results in a rich tonal quality, causing the music to “flow” in a legato style. If you’re just starting to play piano, or even if you’ve been playing for a bit already, you might have wondered what each of the three pedals on your piano actually do. I know that when I first started playing, I was so focused on mastering my technique, doing scales, and essentially following through with whatever my piano instructor told me. I feel like this distracted me from being genuinely curious… since it was only a year or so after that point that I actually learned what the pedals did! Up until that point, I had only known (and used) the rightmost sustain pedal. It just makes your music sound that much better. Well, today we’re going to dig into all three pedals and run through a detailed overview about what each one actually does. Take a look at the diagram above. It should be pretty familiar… but for most of us, still mysterious on the inside! We see these pedals every day we sit down to practice and never really know what’s going on behind the scenes… until now! Let’s run through each pedal one at a time. The leftmost pedal is called the “soft pedal” or “una corda” pedal. Una corda means "one string". One day when I was sitting down practicing piano, I decided to test each of the three pedals out. So that’s exactly what I did… I started with the leftmost pedal and pressed it down while playing a few notes. Hmm.. strange. It didn’t seem like anything actually happened; my notes just seemed to play a little softer and a little quieter. It was almost like I was able to play quiet staccato notes whenever I had this pedal pressed. Well, I was almost there in figuring out what exactly happened behind the scenes. I knew the notes became “softer” and a bit quieter, but was missing the real reason behind the invention of the una corda. Originally, several centuries back, the soft pedal was invented in order to modify the tone and color of notes played on the piano. This was done by literally shifting the action of the piano sideways (you would notice all of your keys literally shift whenever you pressed the pedal), causing the hammers to hit one or two strings instead of the usual three. Typically, whenever you play a note, all three strings are hit and start vibrating. With the una corda pedal pressed, however, only one string (on lower bass notes) or two strings (on the mid to high keys) are hit. 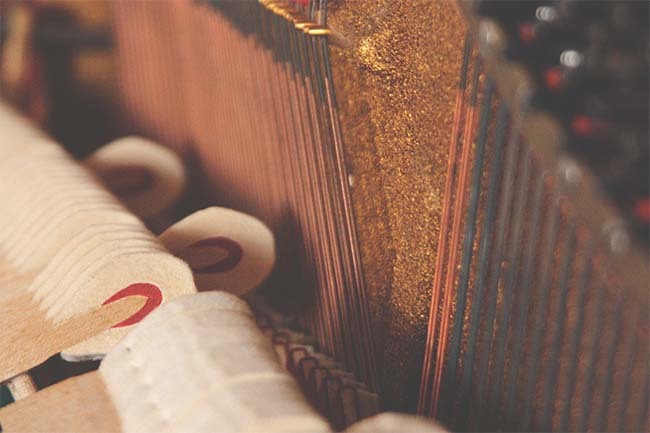 On modern pianos today, it’s usually two strings that are hit with the soft pedal. It’s also important to note that if you have an upright piano, you won’t have a true soft pedal -- meaning the action won’t physically shift. Just like the name infers, the “half-blow” pedal on an upright piano causes the hammers to move down closer to the strings. Then, as soon as you start playing some notes, instead of hitting each string full-on, the hammer only travels half the distance, making it quieter and quicker. This emulates true una corda (generating a softer sound) without actually shifting the action in the back. But before we dive into the details, I want to mention one thing: You can’t assume your middle pedal is a true sostenuto pedal without testing it out. Some pianos nowadays don’t even have a sostenuto pedal. Other pianos, if they do have a middle pedal, don’t have true sostenuto -- they have just another “half-blow” pedal in the middle. As a refresher, a half-blow pedal lowers the hammers closer to the strings and creates a quieter, softer sound. So before assuming that the piano you’re playing has true sostenuto, it’s best to test it out for yourself to be sure. Most high-quality grands do have true sostenuto, but it’s also common to see uprights and lower-end grand pianos that do not. Anyways, on to the question at hand: What does sostenuto actually do? Well, in simple terms, the middle pedal is used to sustain only certain notes -- the ones that were pressed down while you pushed the pedal. These notes remain sustained until you let go of the pedal. If you keep the pedal pressed down and play other notes at the same time, those other notes will play normally without any sustain. Say you want to play a C Major chord in sustain, and a filler melody & rhythm without sustain immediately after (you want the C Major chord to be sustained while you play the melody/rhythm normally). While you’re holding the C Major chord, press down and hold the middle sostenuto pedal; doing this while the keys are pressed down will lift and freeze the dampers of the C Major chord above the strings you pressed. Now you can let go of the chord - you’ll notice that those specific notes you pressed are still being sustained. At this point, you can play the filler melody and rhythm section over your sustained chord. Finally, once you let go of the pedal, the sustain of your C Major chord vanishes. And that’s how sostenuto works! Go ahead and try it out for yourself -- it really is an intriguing pedal. This is the most commonly used pedal, located on the right side of the three piano pedals. The sustain pedal does just what its name sounds like: It sustains (holds) notes until the pedal is released. This adds a rich tonal quality and smooth flow to the music being played. How does the sustain pedal work? It simply lifts every single damper off of the piano keys while pressed, letting all of the strings vibrate freely. Whenever you play a note while pushing the sustain pedal, it doesn't immediately stop as soon as you release the key -- the note is “sustained” until you let go of the pedal. This causes the notes to “meld” together and form a nice, legato-style melody. My hope is that you’ve just learned a great deal about piano pedals, and finally know what each of them does. Although the una corda and sostenuto pedals aren’t used much day-to-day, I’m making it a challenge to use them more on a daily basis (whenever the song I'm playing has a soft part or needs an 'overlayed' melody). 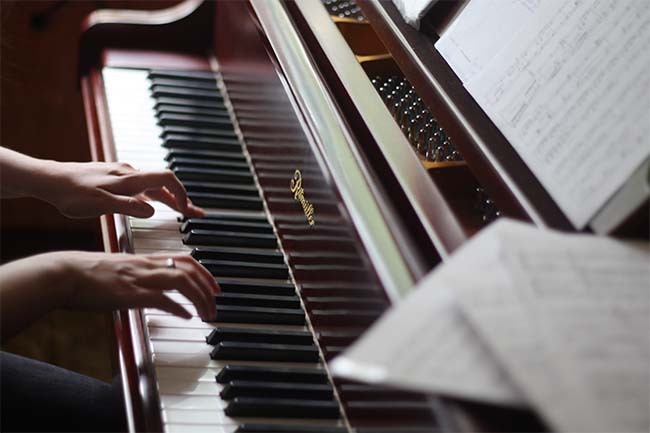 Even if it’s not something you’d normally do when playing a song, it’s always good to try them out and do your best to make the most of your piano! If you found this pedal guide useful, bookmark this page for future reference! What Are All the Notes on a Guitar? What is a Bar in Music?